I’ve been playing with my new yarn photo studio. It’s a small self-contained set-up just the right size for photographing my skeins. 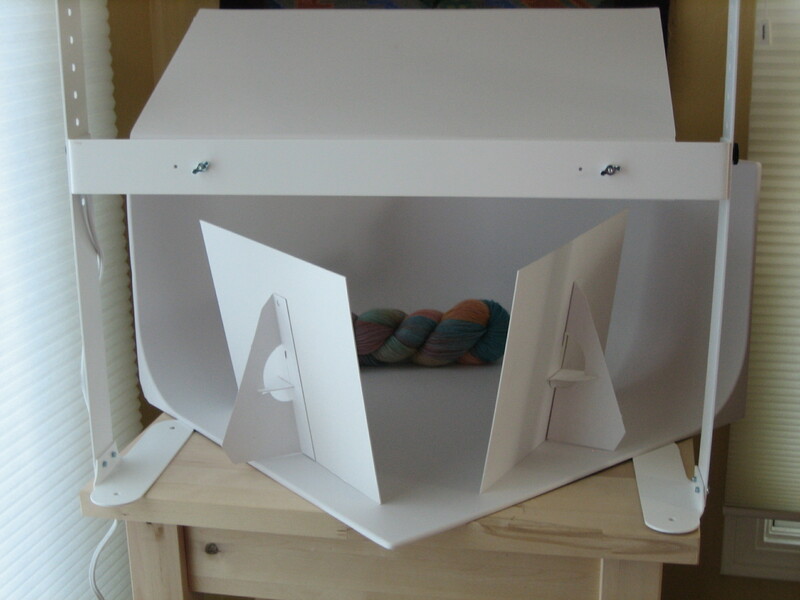 It has a free-standing true color light source, bounce boards and a seamless back drop. I also have a small tripod for my camera. I’m finding that the photos of my yarns are so much better and true in color to the actual yarns. I also like the ease of the set up, its much less hassle for me to take a couple of pics every now and then since everything is all ready to go and set up. I try to take most of my photos at night or with the blinds drawn to filter out any sunlight or shadows in the room. I took a class from Daryl Lancaster in the spring on Photographing Your Work. Before I took the class I was considering purchasing a new camera but now I realize most of my issues had more to do with my set up than the camera I have. I can get nice pictures just be controlling the lighting and changing a few settings on my camera. Its streamlined the process for me and freed me up to have more time for dyeing, knitting and weaving – always a good thing!